Future funding solicitations will be announced on this website and through the OPC listserv. Click here if you would like to be added to the OPC listserv. Please check back regularly for updates. A total of $3,400,000 is currently available for restoration projects that increase marine life associated with marine protected areas (MPAs) in the geographic region of the facilities. Selected projects will be recommended to the Ocean Protection Council for approval at the May 23, 2019 meeting. Staff recommendations will be posted here by May 14. Public comments will be accepted until May 21. 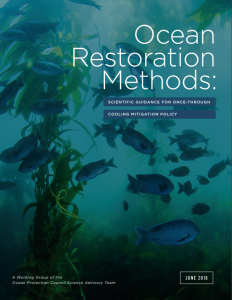 The Ocean Protection Council Science Advisory Team (OPC-SAT) released a report in June 2018 entitled “Ocean Restoration Methods: Scientific Guidance for Once-Through Cooling Mitigation Policy”. This report provides essential guidance on the scientific principles needed to identify restoration projects that meaningfully offset the impacts of once-through cooling. A Working Group of the OPC-SAT, convened by the Ocean Science Trust, applied the best science available to help identify an ecological framework that would allow the evaluation of projects that would have a high likelihood of meeting the requirements of the Policy to increase marine life associated with California’s MPA network. Their findings determined that due to oceanographic currents connecting locations both inside and outside of MPAs, harmful effects of once-through cooling extends hundreds of kilometers from a power plant’s intake pipe. 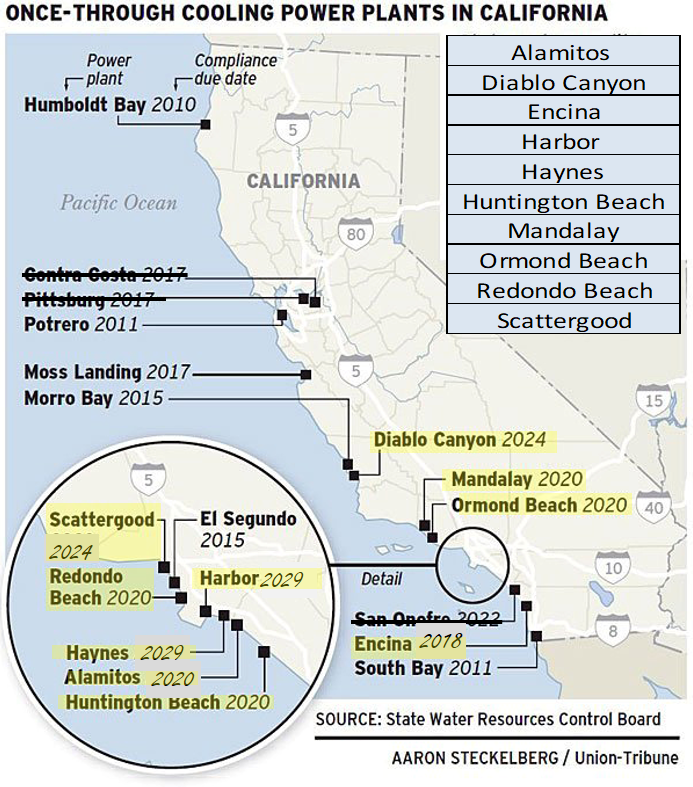 Given the geographic extent of power plants still using once-through cooling, the findings of this report define the areas impacted as the entirety of State waters (3 nautical miles from the coastline) from San Diego to Big Sur coast (near Lucia), including the waters around the Channel Islands. Once-through cooling (OTC) technology pulls water from the ocean to cool power plants. Marine animals, seaweeds, and billions of eggs and larvae of fish and invertebrates are taken in with the seawater and killed as they are subjected to thermal, physical, and/or chemical stresses. Larger organisms may also be pinned against seawater intake screens, causing injury or death. These impacts contribute to the decline of fisheries and the degradation of marine habitats near power plants using once-through cooling. To address these damaging impacts, the State Water Resources Control Board established a Once-Through Cooling Policy (Policy) in 2010 requiring power plants to stop using once-through cooling technology. The Policy originally applied to 19 coastal power plants (including two nuclear plants) that had the ability to withdraw over 15 billion gallons per day from the State’s coastal and estuarine waters using OTC systems. Closed-cycle wet cooling has been selected as Best Technology Available and permittees must either reduce intake flow and velocity or reduce impacts to aquatic life comparably by other means. The Policy requires power plants that are not in compliance to make mitigation payments annually based on their annual intake volume of water until they come into compliance. To ensure grid reliability, final compliance dates were negotiated with each of the plants listed on the map after the name of each power plant (right). Through closures of older plants, denoted by strike-through on the map, and retrofits to come into compliance prior to the payment program beginning, there are now 10 power plants that will be making payments until they come into compliance (highlighted in yellow). OPC will receive up to $5.4 million annually from these mitigation payments to fund to its OTC Interim Mitigation Program. Funds will decrease as power plants come into compliance with the Policy, and the Program is expected to end in 2029 when all power plants are required to be in compliance. The policy gives a clear directive that funds received through this program will support “mitigation projects directed toward increases in marine life associated with the state’s marine protected areas in the geographic region of the facility”. To further implement the Policy and build out the OTC Interim Mitigation Program, OPC entered into a Memorandum of Understanding with the State Water Resources Control Board that allocates $5.4 million of the annual payments to mitigate the impacts of OTC on state MPAs. The allotment amount was based on an interagency budget analysis conducted by the MPA Statewide Leadership Team of costs associated with the MPA Management Program that have a direct nexus with OTC impacts. For more information on the impacts of OTC and how the MPA Management Program is linked to the OTC Interim Mitigation Program, click HERE.